14.0" x 10.5" stitched on 14 count. 10.9" x 8.2" stitched on 18 count. 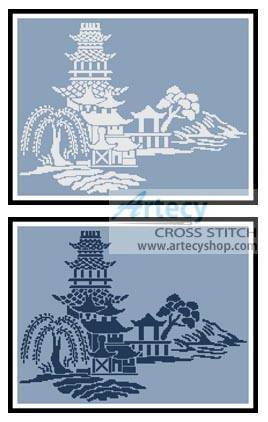 Blue Willow cross stitch pattern... This counted cross stitch pattern of easy to stitch Asian Landscape was created from beautiful Artwork copyright of Joni Prittie. Suggestion is to stitch on blue fabric, with either the blue cotton suggested or use white as a replacement.